There’s something about the spice-sweet combo that I love and could taste the goodness of this recipe while it was only a thought in my head. But Oh My Gosh, the deliciousness of this recipe far exceeded my expectations. 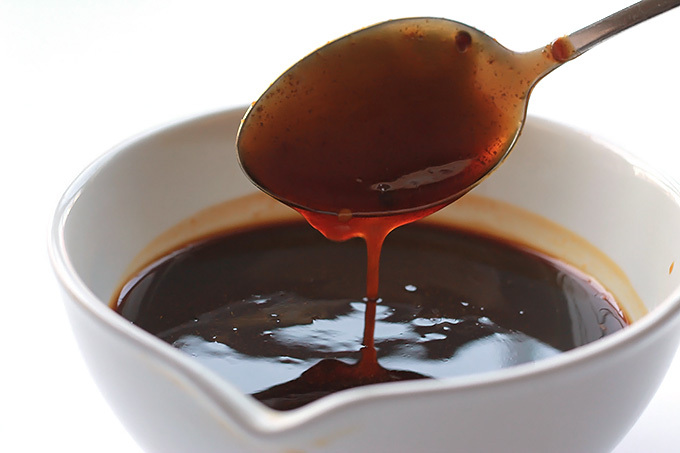 This teriyaki sauce is a perfect balance of sweet to heat and because I used coconut aminos I reduced the amount of sodium in the sauce. I made it three times before I got it right and once it comes to a boil it’s ready in five minutes. Pressing the tofu gets out more of the water. I simply place a clean kitchen towel or paper towel on a shallow baking pan, slice tofu in half, place on towels and place another towel on top of the tofu, then place another pan on top and put a few heavy cookbooks on the top pan. After about 15 minutes it should be ready. After pressing and cubing tofu, toss with the five spice seasoning, set aside while you prep the other vegetables. This recipe is very versatile and comes together fairly quickly, you can serve it as a bowl or wrap. 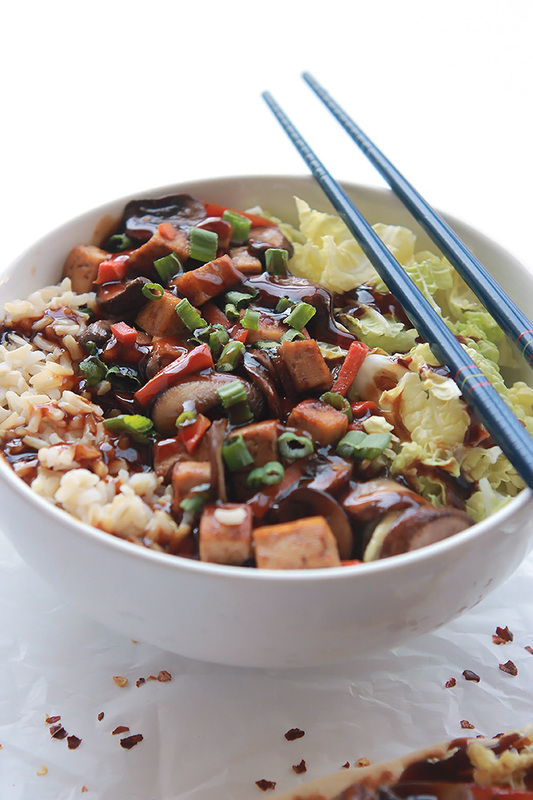 I paired it with brown rice and napa cabbage, but feel free to add in your favorites. Who needs take-out when you have this quick, easy and delicious recipe. If you make this recipe or a version of it, take a picture and share with me on Instagram, tag it #thewholeserving. 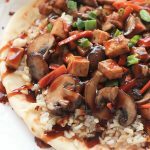 I’d love to see your version of Vegan Teriyaki Tofu Stir Fry! 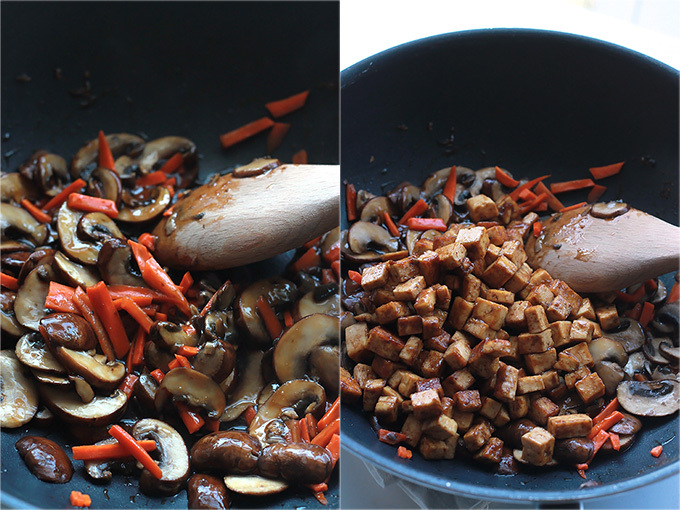 Place all of the teriyaki ingredients in a small saucepan, whisk to combine. Bring to a boil over medium heat, when it comes to a boil, reduce heat to medium and continue to boil five more minutes, stirring occasionally. 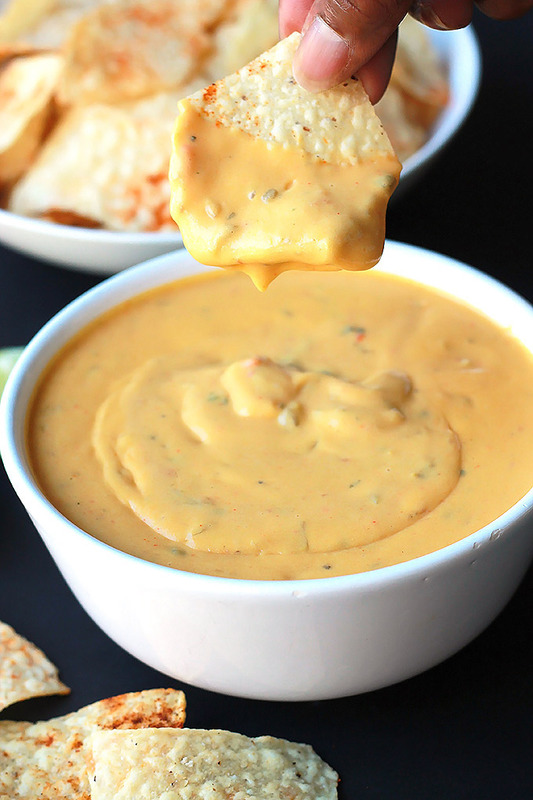 After five minutes sauce should coat the back of a spoon. Transfer to a bowl cover and set aside. Sauce will continue to thicken as it cools. 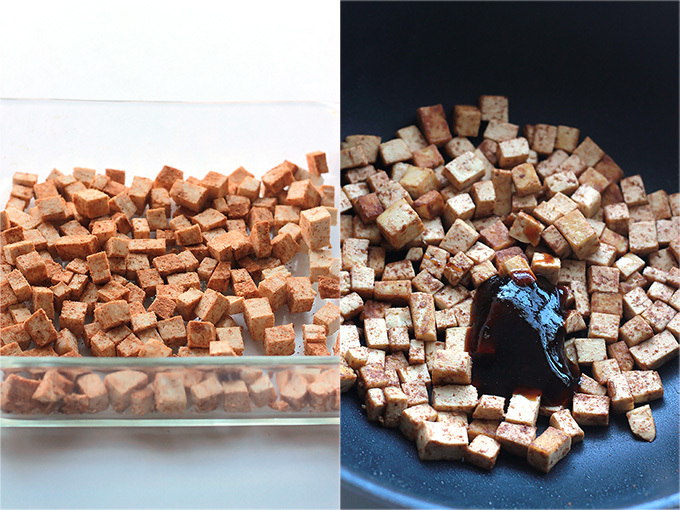 Dice the tofu into 1 inch cubes, place in a shallow dish, toss with asian five spice and set aside. Wash and slice the mushrooms and wash a chop the scallions. Heat 1 tablespoon olive oil in a large skillet or wok over medium heat, when oil is shimmering add tofu to the pan and saute 3 to 4 minutes. Add in 1 tablespoon of the teriyaki sauce and toss to coat and saute about 1 minute more. Transfer to bowl cover and set aside. Add in the final 1 tablespoon of oil and add the mushrooms and saute 1 minute, add in the carrots and minced garlic, saute another minute. Add in 1 and 1/2 tablespoons of the teriyaki sauce toss to coat. Add tofu back to skillet and toss to combine. 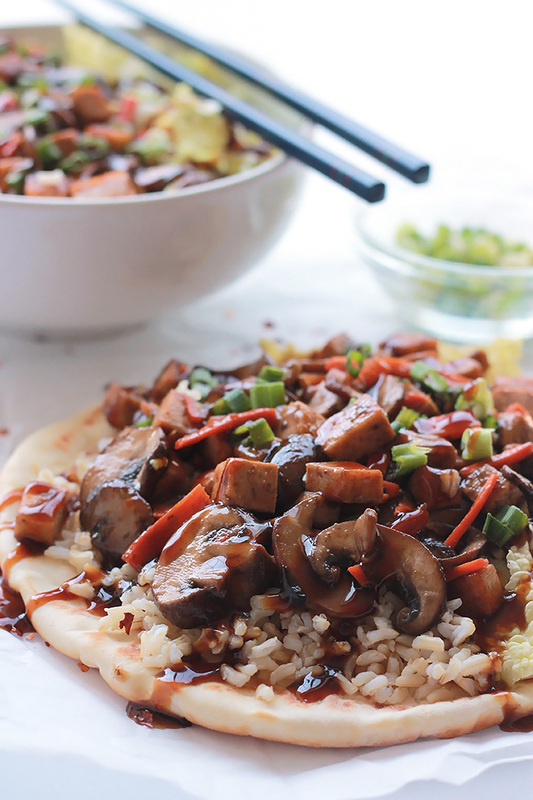 Spoon rice and chopped napa into a bowl, spoon tofu veggie mix on top, garnish with scallions and drizzle with a small amount of toasted sesame oil or serve on top of flatbread. *Leftover sauce will last two weeks stored in an airtight container in the fridge. *Chicken can be swapped for tofu if you are not a tofu eater. I love a good stir fry recipe! Is there a brand of red chili paste you prefer for this recipe? Thanks! I usually buy mine from an Asian grocery, but I think it’s also available in regular grocery in the Asian section. The brand I use is Sambal Oelek labeled as ground fresh chili paste. I hope this helps. I am a huge fan of stir fry. Once I figured out where to buy teriyaki sauce I started making my own. When I first moved here there was no place that carried any kind of foreign or exotic foods. Of course things have changed quite a bit since then. And now I try to make stir fry regularly. I will definitely be making your recipe. Hopefully it’s as good as yours. Thanks for this recipe, Celeste! We love Asian food and especially stir-fry. Carol I hope you have a chance to give this a try soon. Have a wonderful weekend. It looks delicious! Tofu is our family favorite and I always look for options to have it. I have to admit Swati this is fast becoming my favorite. You have outdone yourself. This is exactly what I wish I had for dinner tonight. Oh my gosh, just yes please! 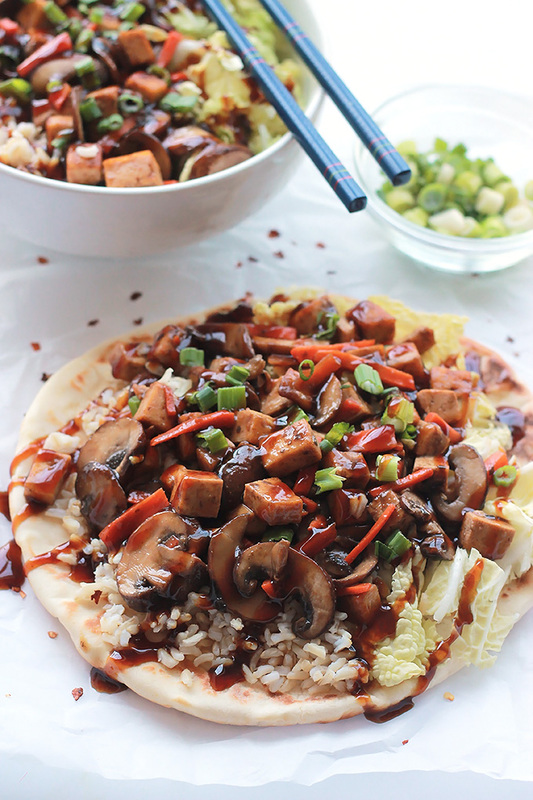 I love this style of food and it’s one of my favorite ways to eat tofu. I usually get the store bought teriyaki or buy some dish from a restaurant. I’m just now developing how to make sauces at home. So, this is a perfect recipe for me right now. I can just see my hubby’s excited face as he sits down to eat a plate of this. 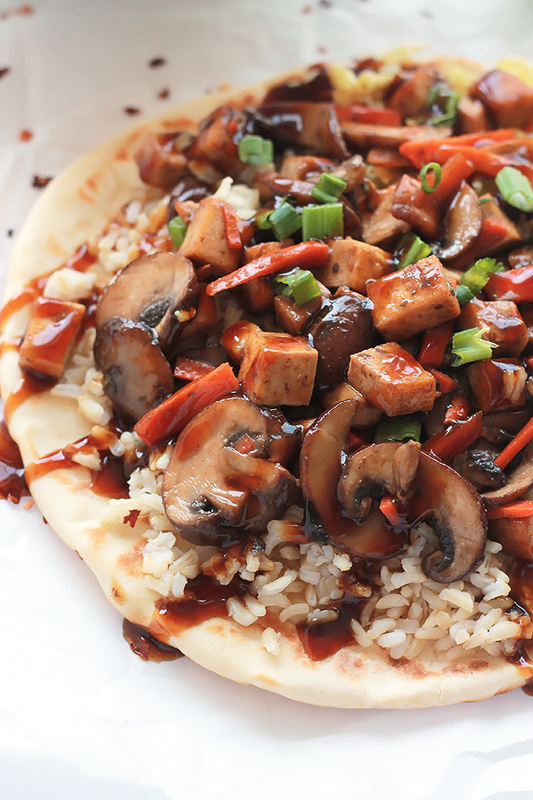 We love teriyaki tofu! Pinning for later! Gina I’m so glad to hear that you like tofu, when I mention tofu to people I get the ugly face. I didn’t always like it, but once I learned how to prepare it I was excited to try it in different recipes. I’m glad you like it and this sauce is so easy. Hi Celeste, so..full disclosure…I haven’t quite embraced tofu yet…but I am trying. My daughter loves it and has been encouraging me to try some recipes that include it. This might just be the one that entices me to give it a try. Thanks again for your beautiful photography and delicious sounding recipes. Lynn, I have to admit I didn’t always like it, the first few times I had it I hated it. The problem was I was using the wrong tofu for the recipe I was preparing. I like to use extra firm and I press it to get out even more of the water. It really doesn’t have much of a flavor it takes on the flavor of the foods it’s paired with.Give this one a try and let me know what you think. This looks so delicious! my husband eats meat but I bet with the sauce he wouldn’t even notice it was tofu! I might sneak it in next time see if he does! stir fry’s are amazing and we love them in this house, they are so great for quick dinners and lunches – definitely pinned for later!! That’s so funny Charlotte, please let me know how it goes with your husband. I love teriyaki and stir fry, Celeste. I have never tried it this way! Thank you for sharing at #overthemoon. Pinned nd tweeted. 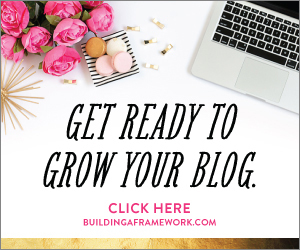 Thanks Marilyn, now that I’m blogging full-time I hope to be at the party every week. coconut aminos? I have never heard of it. I am a big fan of Braggs Liquid Aminos however…. Congratulations! Your link was my feature choice on #overthemoon #12! Please stop by and check it out. Thanks Jess, this dish is one of my favorites. This looks delicious and so healthy- I love homemade versions of take-out so much more when they are guilt free! This dish is so delicious and I loved having leftovers for lunch the next day. Is there a good substitute for the coconut? I can sub out the corn starch with Arrowroot starch. Then we can make it our own allergy free. I would love Chinese again. Kellie you can use soy or tamari sauce for a gluten-free version. I hope it works for you. I know how it is with food allergies, my daughter has a peanut allergy and I’m allergic to shellfish. We read all food packages.